I went and helped with my nieces last night while my mom attended a meeting. They were overall pretty good - for them. My mom didn't make it back in until just about 10pm and I hung out talking to her until almost 1am- meaning that I didn't get home until almost 2am and couldn't get to sleep until after 3am. I am EXHAUSTED!! SO, I'm trying to busy my mind with pleasant thoughts and pretty colors. 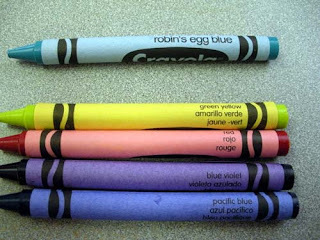 Has anyone else had noticed the strange things going on with crayons lately? I am a HUGE fan of Crayola Crayons. The smell of a new box always excites me. I was playing around with the box of 64 you saw in Friday's post. I began to wonder what the name was of the lovely shade of blue with which I was coloring. So, I turned the crayon to realize that this crayon was not only pacific blue, but also azul pacifico AND bleu pacifique. As I sorted through the box, I found that almost all of my crayons' colors were named in three languages. All except for Robin's Egg Blue. What's up with that? Has anyone else noticed that their crayons were trilingual? I bought these in January and just noticed the change. How long have my crayons been smarter than me? Wow! I haven't had new crayolas in a while, that's really interesting! Margot - Thanks SO MUCH for stopping by my blog, it really means a lot. I wouldn't have bought the crayons either but I was out of town and wanted something to do to occupy a little bit of time - A COLORING BOOK was my answer. Plus, I couldn't pass up the chance to buy a new box of crayons!! Mmmmmm - that smell! !